There seems to be an outbreak of lying. I won’t set foot in the political arena. That’s too easy. But, how about Ryan Lochte the Olympic swimmer? OK. An athlete is allowed to get drunk after he’s finished his Olympic events. However, what prompts a wealthy, accomplished, thirty-two year old man to deface a gas station bathroom? Come to think of it, what prompts anyone to enter a gas station bathroom? But, I digress. Then, even though caught on video, Lochte lied about the bathroom blunder. Gun to his head? Huh? Letting his fellow swimmers be detained in Brazil while he jetted back to the US? Now, that’s sportsmanship. Lochte sounded uber-media coached when interviewed after getting caught in the web of lies he’d spun. If you have to be coached on how to tell the truth, lying is your default behavior. When interviewed by Matt Lauer on The Today Show, Lochte looked appropriately chagrined. Then he said, “I over exaggerated.” I’ll have to remember that phrase in case I’m ever lucky enough to coach a liar. Perhaps I’m taking this too personally, but I think liars assume we’re stupid, naïve, groupies who will forgive their “over exaggerations.” Many get a kick out of getting away with lying. They laugh at what doofuses we are. For some, lying becomes a habit. It becomes easier than telling the truth. It starts out with white lies. We’ve all told a few of those to save face or not hurt someone’s feeling. “Does this dress make me look fat?” That question often prompts a white lie. 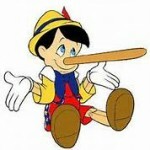 For some though, white lies are the gateway drug to compulsive lying. Get thee to liars anonymous forthwith. The truth hurts sometimes. However, the truth can be remembered. I don’t know about you, but I don’t have enough memory bandwidth to create complicated snares of fabrication. Remedy: Tell the truth. Take your lumps. Apologize. Move on. Don’t do it again. If you don’t believe me, here are some quotes that reinforce my unrevolutionary point that lying is not a good habit to take up. So, tell me the truth. Does this article make me look fat?